I posted a picture of Belle on this page. My lovely fluffy white Coton Belle! She went to be spayed but just never recovered. I was so upset. Two months later Honey and Belinda arrived to cheer me up! My two gorgeous new Cotons! Am finding two Cotons are easier than one and am loving every second with them! They have very different personalities and that's great! Comments for Honey and Belinda! They r adorable. The one on the left in pic w/blue looks like the hair Jonah has & the way it lays. Congrats on ur New puppy family. So sad for little Belle. 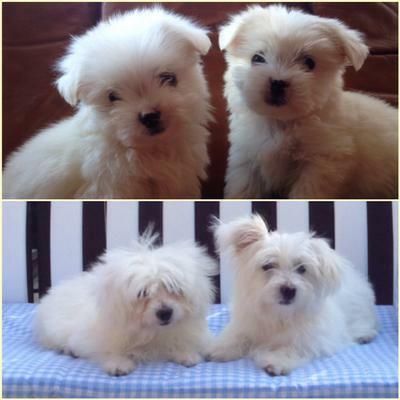 Loving your new pups,Honey and Belinda melted my heart, how sweet those two are! So sorry to read of you losing Belle. That is so tragic.......Your new babies are just adorable. What one doesn't think of the other one will. What fun they can be and such cute pic's. They look amazing on those outside benches. Such amazing names, they really suit them! Makes me want another! Enjoy them!